'The intrusion in Chumar, during and beyond the Chinese president's visit, is unprecedented and has qualitatively changed the tone of the India-China relationship,' says Jayadeva Ranade, a member of the National Security Advisory Board. Over three months of hectic diplomacy by Prime Minister Narendra Modi, which witnessed an effort to re-energise some important relationships and highlight India's space for manouevre, has begun to wind down. The efforts will culminate with the meeting in Washington, DC with US President Barack Obama next week, which is the high water point of these efforts with Modi having held summits with the leaders of two of the other power centres of this region, namely Japan and China. He will then assess first-hand the potential of each relationship. Xi Jinping's visit to India from September 17 to 19 -- the first by a Chinese President in eight years -- was important. China's new ambassador in New Delhi and Chinese official media reports described it as a 'landmark' and 'historic.' There was anticipation that the meeting between the two leaders, both of whom have strong mandates and a demonstrated capacity to take bold initiatives, would move the India-China relationship forward and add meaningful content to it. Xi Jinping belied both expectations. 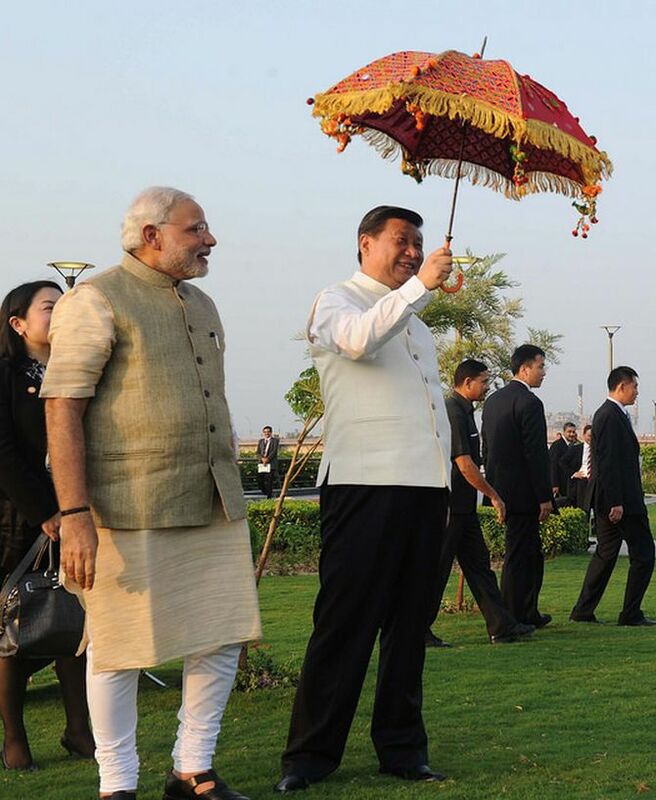 Image, above: Prime Minister Narendra Modi with Chinese President Xi Jinping in Ahmedabad, September 17, 2014. The statements of both leaders, presented after the delegation talks on September 18, contained evidence of the differences in their respective positions. Modi placed the border issue, intrusions and ongoing confrontation at Chumar in Ladakh and other locations on top of his list and sought to underscore the need to ensure such incidents cease as otherwise they would restrict progress in other fields. The prime minister stressed the need to resolve the border dispute 'as soon as possible.' In contrast, the Chinese president referred to the border issue almost at the very end of his statement and made no mention of an early resolution. Modi additionally referred to the issue of stapled visas for residents of Arunachal Pradesh and Jammu and Kashmir and diversion of the Brahmaputra river waters. Xi did not mention any of these. 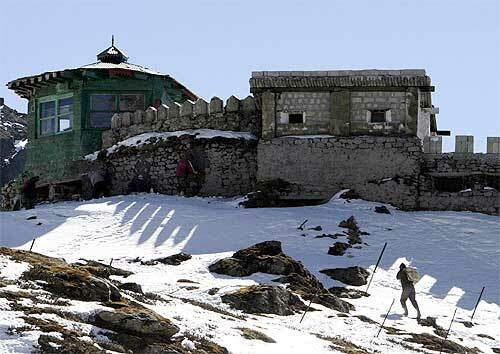 India did, however, indirectly acknowledge that the Tibet Autonomous Region is a part of China, to reciprocate China's agreeing to open Nathu La in Sikkim for pilgrims travelling to Mansarover, thereby further implicitly acknowledging India's sovereignty over Sikkim. The joint statement, issued on September 19, did list areas of agreement and cooperation including the railways, exchange of students, deputing teachers for teaching Chinese. Included in the areas of cooperation were climate change, food and energy and cooperation on international issues etc. In his keynote speech at the Indian Council of World Affairs on September 18, Xi said little that was new. He made quite clear that there is no change in China's position regarding India's admission to the United Nations Security Council as a permanent member. He suggested that India should dovetail its 'Look East' policy with China's economic development plans and emphasised that China is willing to help the economies of South Asia, including India, and to build connectivity. 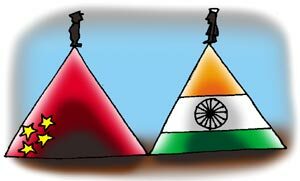 It was clear that China continues to view India merely as one country, albeit the largest, in South Asia. Interesting, though, was his acknowledgement, perhaps for the first time in decades by such a high ranking Chinese leader, of the large trust deficit that exists in India-China relations. Instead of addressing it, however, the lengthy intrusion in Chumar -- that has lasted beyond Xi's visit -- has only added to this distrust. China's focus on developing economic cooperation ever since Modi took over as prime minister has been unwavering. As Xi prepared for his journey to India, a steady trickle of 'managed' leaks created the illusion that China is willing to make huge investments in India totalling many billions of dollars. The figures mentioned ranged between $100 billion to $400 billion, but at no stage was there any official comment by China except, on the eve of the visit, when the Chinese consul general in Mumbai was quoted as saying that China would invest $100 billion. In the end, China committed only to $20 billion, sizeably less than Japan's investment promise of $50 billion spread over five years. Given China's track record, less than half the MoUs it has signed can be expected to actually translate into projects. China is intent on getting India's endorsement and participation in its 'New Silk Road Economic Belt' initiative, approved at the Third Plenum of the Chinese Communist Party in November 2013 and intended to facilitate the westward passage of the Chinese economic juggernaut. This initiative is being personally steered by Xi. The project envisages a surface transport link originating in China's southern Yunnan province and transiting through Myanmar, Bangladesh, India's North-East, Bhutan, Nepal, Pakistan and via the Central Asian Republics to Turkey and beyond. The other economic venture of interest to Beijing is the Bangladesh-China-India-Myanmar initiative. Modi's government stalled both these initiatives, which, if agreed to, will make the already fragile economies of India's North-Eastern states more vulnerable and India's northern frontiers more insecure. The Maritime Economic Silk Route is the other Chinese initiative of interest to Xi. Before his arrival in India he had stopped over in the Maldives and Sri Lanka and secured their full support. Modi withheld endorsement of this proposal too. China's 'peripheral diplomacy' (zhoubian) policy approved in October 2013 is integral to successful implementation of these three economic initiatives, each of which also has a strong strategic import. The policy, for the first time ever, categorises China's neighbours as 'friends' and 'enemies.' It promises substantive economic, security and other benefits, including those flowing from the global influence that China wields, to 'friends' who support China's regional objectives. Nepal, Pakistan and Sri Lanka have been informed that they are viewed as 'friends.' The policy similarly cautions countries who are hostile to China, or oppose it, that they will be confronted with sustained periods of tough sanctions and isolation. The intrusion in Chumar has certainly overshadowed Xi's visit. Its continuance during and beyond the Chinese president's visit is unprecedented and has qualitatively changed the tone of the India-China relationship. In addition to conveying that issues concerning China's sovereignty and territorial integrity trump all other considerations, it also warns India against drawing closer to Japan or the US. Amidst arguments proferred by Chinese and pro-China elements that the Xi visit was overall a success and the incidents on the border should not be exaggerated, a couple of disingenuous reports have appeared. One palpably unacceptable report surfaced on September 19, claiming that Xi had assured Modi that he had instructed PLA forces to withdraw. Another more recent report that appeared to similarly spread specious disinformation suggested that on return to Beijing, Xi had summoned PLA commanders and urged them to follow orders. It is likely that around the same period Xi could have met senior military leaders to finalise promotions to the Central Military Commission. The intrusion and consequent ongoing military stand-off in Chumar is undoubtedly a carefully planned and calibrated military action. As in the case of the intrusion in the Depsang Plains in Aksai Chin last April just before Chinese Premier Li Keqiang's visit, it would have been approved by the Chinese Communist Party's Politburo and Central Military Commission. Both are headed by Xi. The authority exercised over the PLA by Xi, described by the authoritative party fortnightly magazine Qiu Shi in its June issue as 'one of China's greatest Communist leaders,' is unchallenged. Xi has also either selected, or approved the selection, of senior PLA commanders. Particularly, the commander of the Lanzhou military region which includes the Ladakh region in its overall area of responsibility, was promoted by Xi and has publicly expressed fealty to him. The political commissar of the Lanzhou region has also benefited from a promotion given by Xi this July. Similarly, the commander of the Ali military sub-district subordinate to the Lanzhou military region exercises direct operational jurisdiction over the Depsang Plains and other areas in Ladakh. He has sound political credentials. Neither of them would have acted without approval from the appropriate authority. Both commanders have, incidentally, been in position since 2012. The intrusion and ongoing military stand-off in Chumar in Ladakh that persists despite three flag meetings held so far is rather disconcerting and needs to be viewed seriously. It at once signals that Beijing is 'testing' the Modi government and neither is it unduly concerned about any embarrassment caused to the Indian government. Jayadeva Ranade is a member of the National Security Advisory Board and former additional secretary in the Cabinet Secretariat, Government of India. He is president of the Centre for China Analysis and Strategy. The views expressed in this column are personal. Let's salute an unhonoured hero!